The footage was shot at the SpaceX Hyperloop Pod competition over the weekend, and this is the winning design in action. Perhaps we all agree that all good things start as an idea that burned a passion so strong there is nothing else left to do but to realize it. 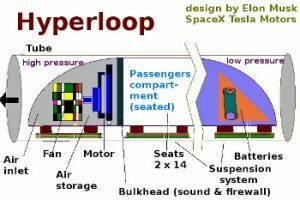 A wise man of vision and guts, maybe it takes a man like Elon Musk to realize such a visionary dream like the Hyperloop. But since it is still in its early stages, it is inevitable for problems to occur and they are facing multiple issues right now in their attempt to revolutionize transportation as expected. They’d lost connectivity. The vacuum needs to be unsealed and the pod fiddled with. Then the vacuum must be resealed and all the air inside pumped out. Revolutionising transport takes time. The Swiss loop team eventually re-established communications with their pod and successfully completed a test on the track. Two-dozen student teams were competing – but only three qualified to test their pods in the Hyperloop tube. In reality, the Hyperloop isn’t just Musk’s brainchild, it is a collaboration of some of the world’s brightest innovators that will help him realize his vision. Exceptionally bright students from the world over make their own prototypes and compete with others to find out whose idea/work is the best among the rest. But for now, the rest of the world may raise their eyebrows and think of all their efforts as fictional but like with any technology we now have and enjoy, they all seemed impossible at first but became our reality with the brilliants minds and persistence of these innovators at work.